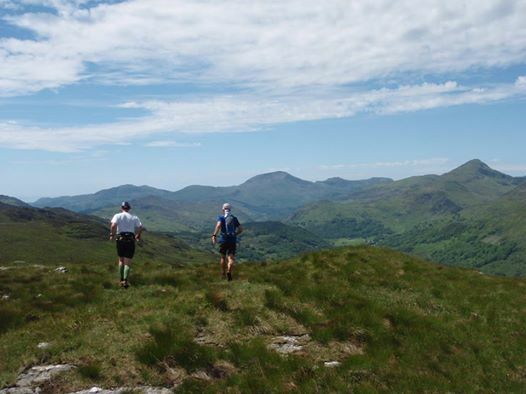 The Charlie Ramsay Round is a running challenge in the Scottish Highlands, the aim being to cover 56 miles, 24 Munros (mountains over 3000ft) with a total of over 28,500 feet of ascent in under 24 hours. Standing outside Glen Nevis Youth hostel on a sunny day in late May I was feeling a little nervous. The plan was to tackle the “round” with my mate Ian with only limited support; a couple of people meeting us at Loch Treig (about eight and a half hours into the run) with food and supplies for the next leg, and someone at a remote point by Loch Eilde Mor another 6 hrs later, again with food and enough supplies for us to get to the finish. 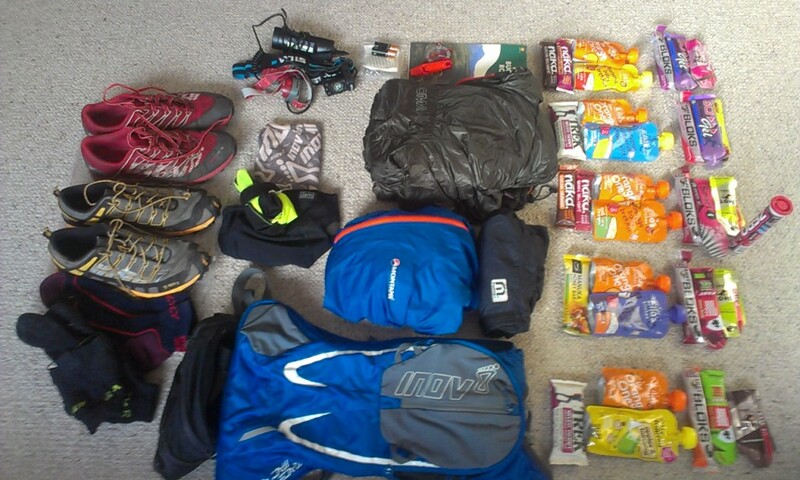 We would have no support on the hill so would have to navigate ourselves and carry all our own kit. This also meant that we would have to “manage” ourselves i.e. keep an eye on our schedule, make sure we were eating and drinking enough and motivate ourselves when the going got tough. My main concern wasn’t the physical difficulties of the Ramsay Round but the fact that I’d only managed one reccy of it and had no knowledge of the route through the Grey Corries. This was going to make route finding a bit more difficult and meant that we hadn’t had chance to check out the quickest lines. I was pretty confident that we could navigate the route but we couldn’t afford to spend lots of time studying the map. Choosing a bad line would be costly. Not having run the first section also meant that it was difficult to know what schedule to use as we had no idea how hard it felt. We set off clockwise just after midday on Monday (our original plan for a weekend attempt had been postponed by bad weather) in warm sunshine. The forecast was for dry weather and equally importantly light winds. After 15 minutes of jog / walking up the Ben Nevis tourist path we passed a group of lads looking hot and tired who asked us “how far to the summit?” Not sure they believed our “a few hours!” reply! Things went well for the first few hours, the rock was dry, visibility was good and navigation was straightforward. After Aonach Beag we found a good line down “Spinks’ Ridge” named after the line Nicky Spinks took on a previous round. We were slightly behind our schedule but had heard that it wasn’t a big deal to be slow on leg one and not to worry if we were 15 minutes or so down. 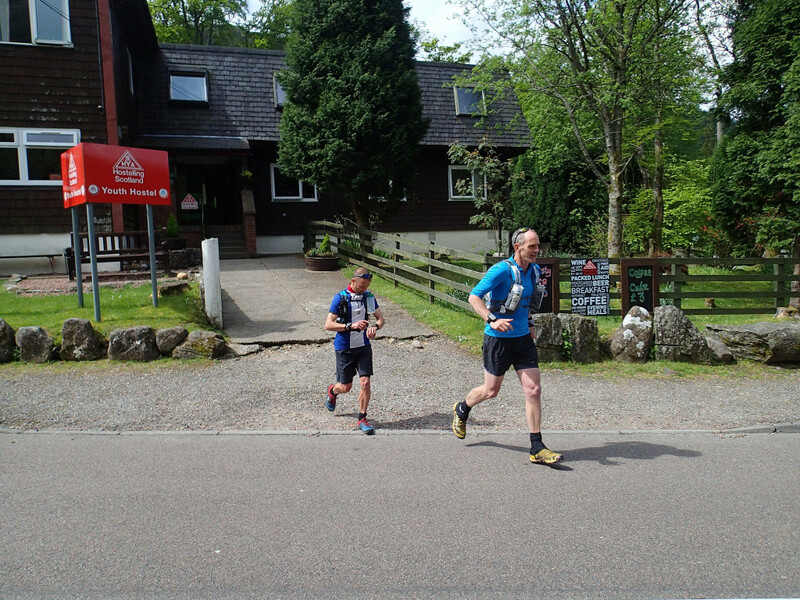 However towards the end of the leg Ian wasn’t feeling too good and by Loch Treig we were over half an hour down. Helen and Pawel our 2 support crew were sheltering on the dam wall from the un-forecast rain shower (thankfully the midges hadn’t yet emerged) with our supplies and we were soon wolfing down some real food. 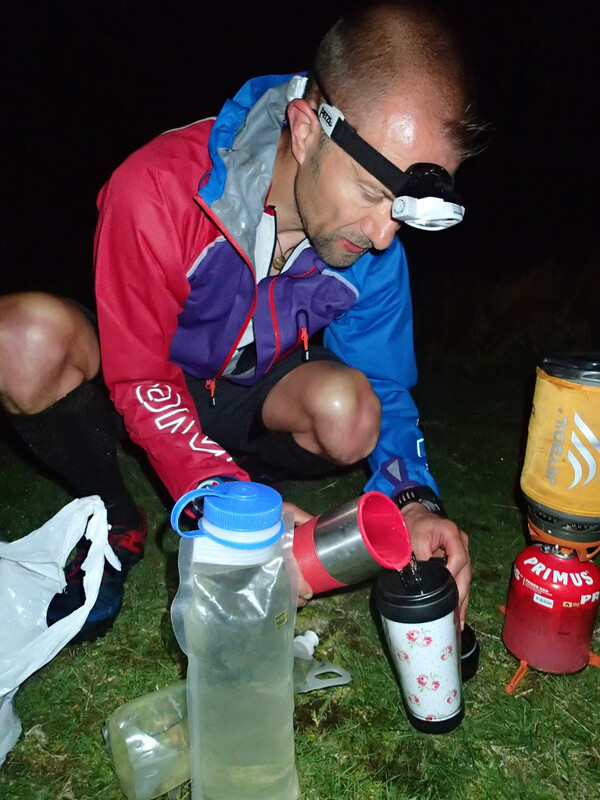 Ten minutes goes very quickly and no sooner was my chilli con carne scoffed than it was time to go again, picking up fresh drink, food, map and head-torch for the night leg. We’d had the chat beforehand about splitting up if one of us was struggling and so as we headed up the lower slopes of Stob Choire Sgriodain Ian did his “Captain Oates” impression and urged me to press on. That was definitely the lowest point of the round, leaving my mate who was struggling and heading off into the gathering gloom alone. It was going to be a long night! I hit Sgriodain on schedule and turned my torch on. The good news was that I was back on schedule for that summit and confident that I could make up lost time, the bad news was that low cloud was covering the summit and navigating to Chno Dearg was going to be tricky. I wasn’t looking forward to the next section, I had reccied it and knew it involved a rough, steep descent off Chno Dearg and an awful, steep climb through heather up on to Beinn na Lap. In daylight I had been able to pick out the lines of least resistance but it would be harder in the dark. Masa had cycled in from Mamore Lodge the previous evening and was waiting by the ruin in his tent with hot water and my supplies for the next leg. I struggled with my ration pack bacon and beans but the licorice tea was fantastic! I had made some time up on the previous leg despite being solo in the dark and with a grey hint of dawn in the eastern sky I knew that the worst was behind me. 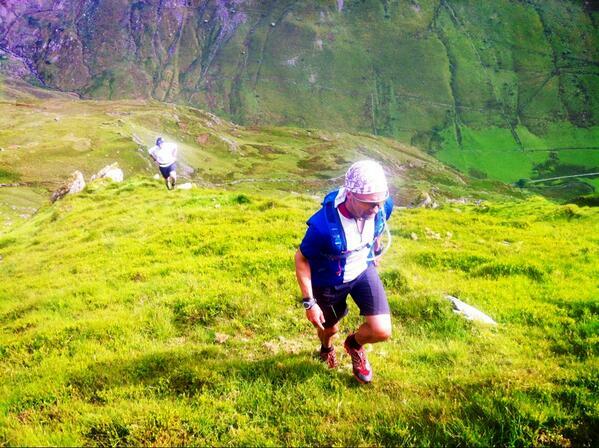 I’d reccied almost all of the next leg through the Mamores and as long as I kept eating and drinking I felt I could continue to make up time. Refreshed and resupplied and with Masa’s spare head torch I set off on the long haul up Sgurr Eilde Mor. By the summit the torch was off and I’d whacked 9 minutes off my schedule without killing myself. With the night behind me and the sun rising into a cloud free sky I knew that I could do it. 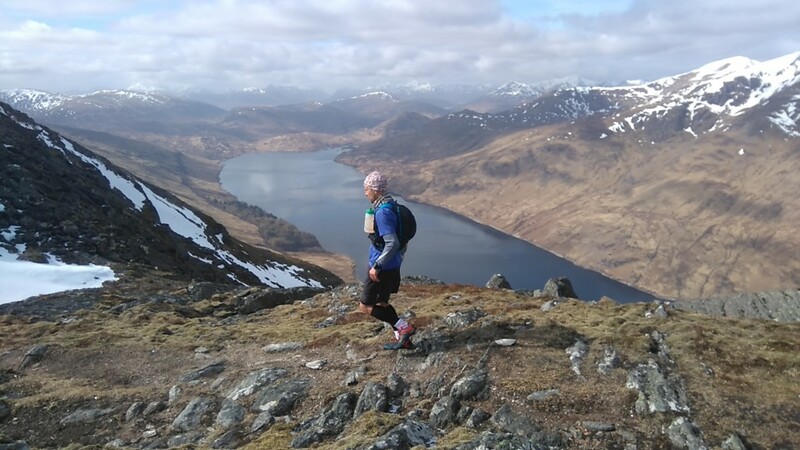 It was just going to be a long run, in lovely weather in the glorious Scottish mountains – what was not to like! The Mamores passed without incident apart from meeting two people! At each summit I looked ahead and identified my next target, then looked at the schedule and said to myself “No way!” The time allocated seemed impossibly short “It will take me loads longer than 35 minutes to get up there!” But it didn’t, I was knocking time off at every Munro. Feeling strong towards the end I was able to push on and when I managed to take 12 minutes off the Stob Ban split I knew that barring disaster I was home and dry. 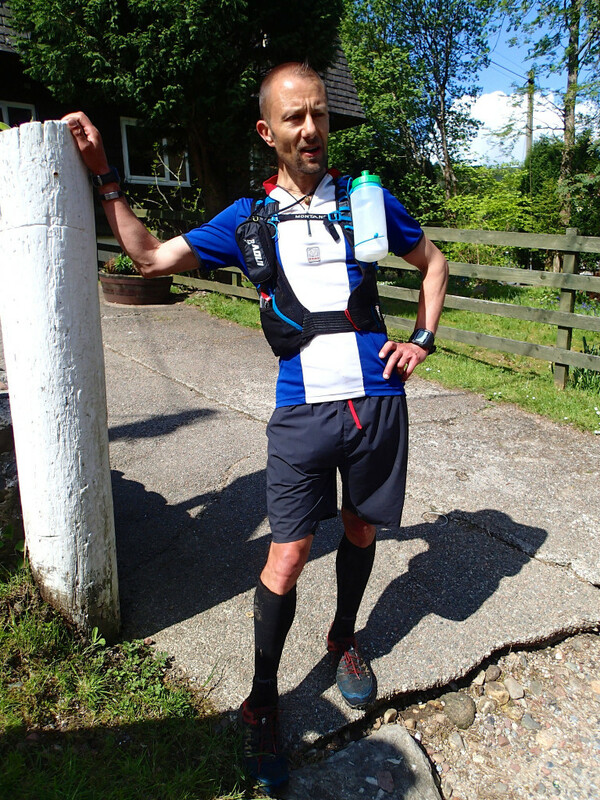 The route is a mix of different terrain: rocky, heather, track, short grass so for footwear I chose Inov-8 Mudclaw 300 which I knew would cope with everything. My feet were sore at the end and I had a couple of bruised toenails but no blisters. The only time I noticed my feet hurting was coming along the hard track and road at the end – you could possibly consider changing into something more cushioned for the last 30 minutes or so. 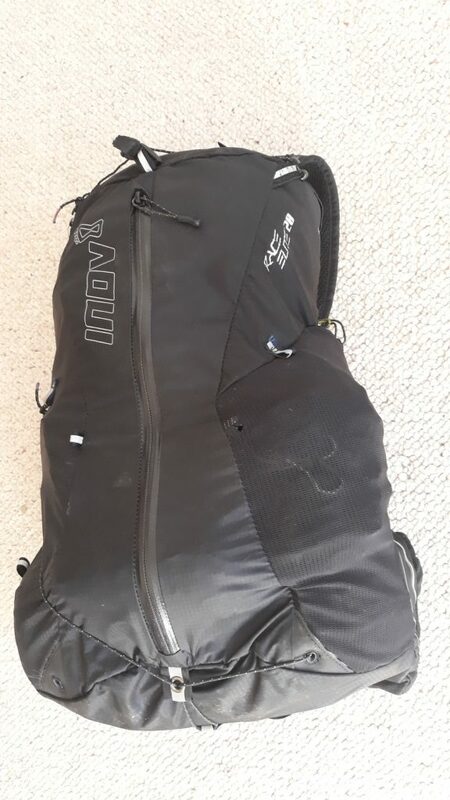 Running for over 23 hours with a backpack means that it needs to be comfortable! 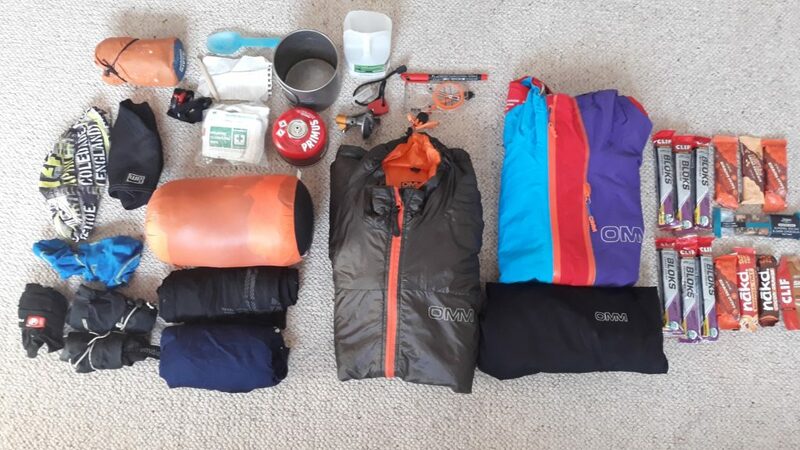 I used the Montane Jaws 10 which was big enough to fit in enough kit for a solo attempt. Mine is the older version with rigid bottles and I carried one bottle which was easy to refill from streams. 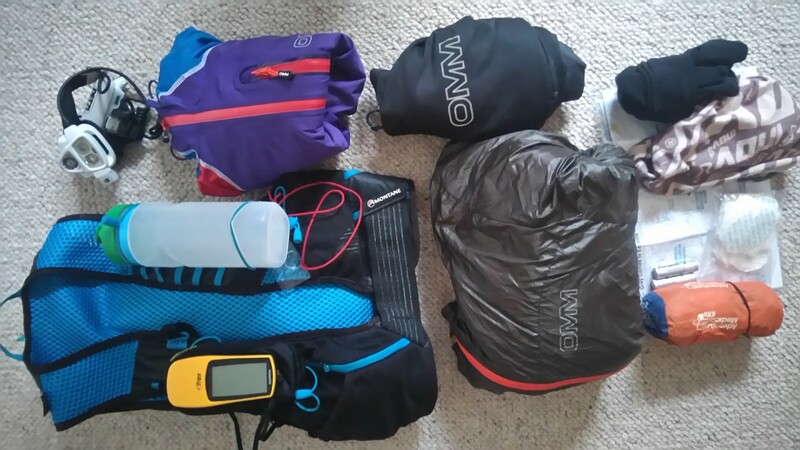 The front pockets carried my compass, folded map and emergency phone whilst I adapted the pack by using an attachment from another bag to carry my Garmin Etrex GPS. I chose the Petzl Nao head torch for 2 reasons; its long battery life and its reactive capability which would make map reading more comfortable (it automatically dims and so doesn’t dazzle with reflected light from the map). Unfortunately I made the mistake of selecting high power reactive rather than low power reactive which meant I only got four and a half hours from the battery rather than the anticipated 6 hrs +. Thankfully it got me through leg 2 – just! I carried OMM Kamleika waterproofs (top & bottom) and had to wear the jacket (smock) when it started raining towards the end of leg 1. I kept this on until dawn, the deep zip allowing me to vent the smock when working hard. 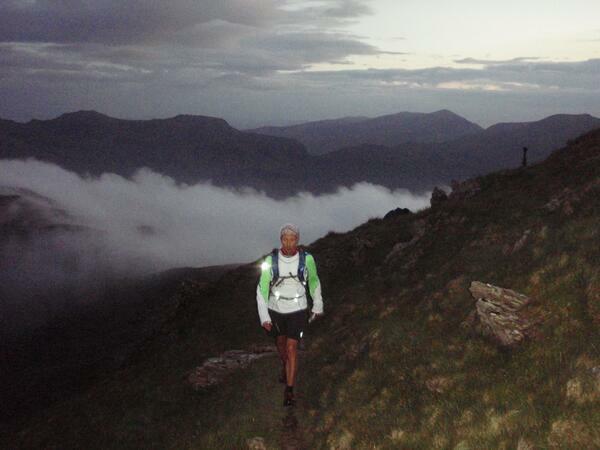 I wore thin gloves for the night leg and carried a buff (not worn). I carried an OMM Rotor Smock as an emergency layer as well as a long sleeved base layer (not used). 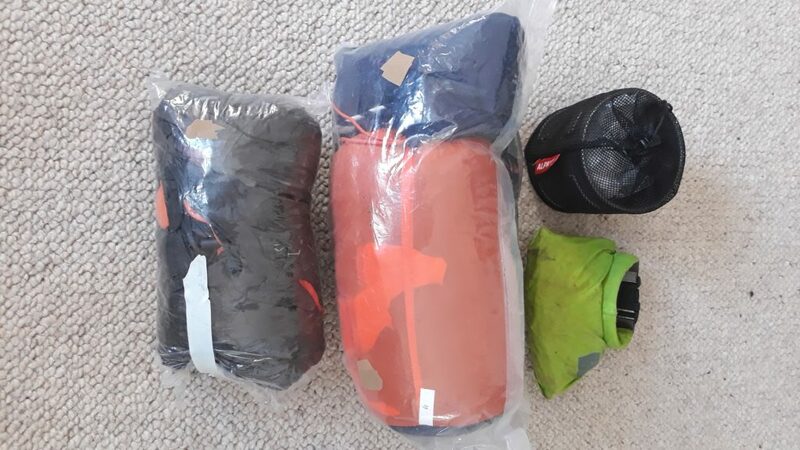 Other emergency kit incluced a SOL emergency bivvy along with a small first aid kit comprising of bandage, plasters, paracetamol and 2 sheets of toilet roll – not needed! – and a mobile phone. I also took 2 spare batteries for my GPS. 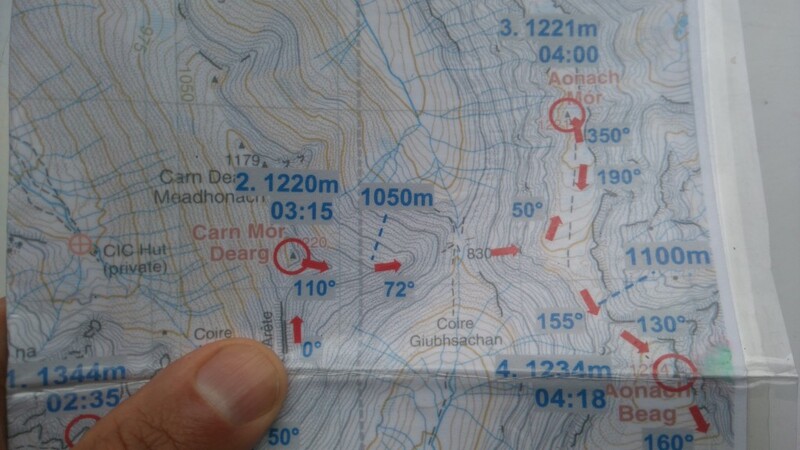 I laminated sections of map, annotated with route notes and compass bearings. Having these back to back meant that I needed 5 separate maps for the whole round. 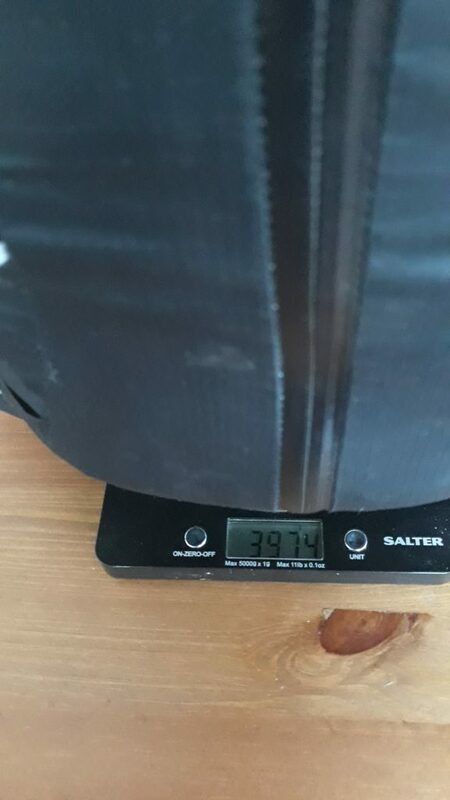 I recorded the run on an old Garmin Etrex hand held GPS (I changed the batteries after 15 hrs) and recorded the split times on both a Garmin 910XT (which lasted about 16 hrs) and a Polar 610 sports watch (non GPS). Being unsupported on the hill meant carrying my own food and so was a balance between taking enough and being overloaded. I found on the Paddy Buckley round that I took too much and the same was true this time. Food for the hills was a mix of Nakd bars, Aldi pressed fruit bars, Cliff Shot Bloks, assorted gels and my secret weapon: baby food in the form of Ella’s Kitchen pouches. I used Elivar Endure and Hydrate Plus powder mixed with water that I found on route and from the 2 resupply points. I ate “real food” at the resupply points: Adventure Food chilli con carne with rice and bacon and beans. I was planning to have my favourite Bombay Bad Boy pot noodle in the middle of the night but as I was behind schedule I didn’t want to wait for it to rehydrate (it tasted good at the end though!) I had a bottle of Lucozade at Loch Treig support point and cup of licorice tea at Loch Eilde Mor. Water was plentiful on the route. 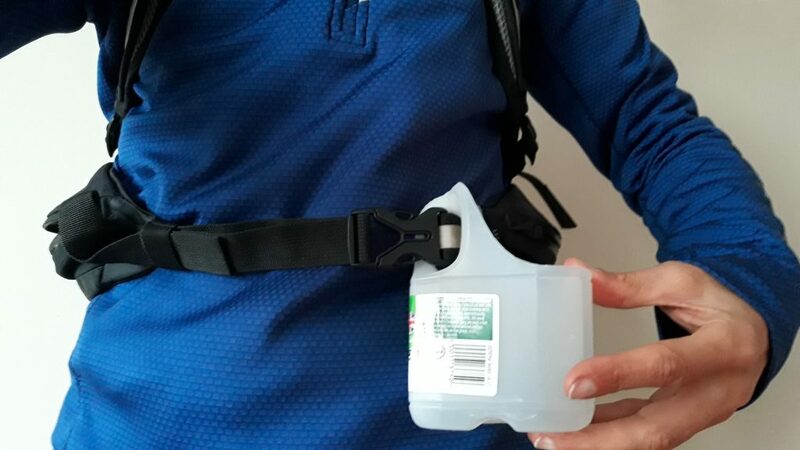 I started fully hydrated and rather than carrying drink from the start I put powder in my bottle and filled it when I got to the Red Burn. This was by good old fashioned map and compass with pre prepared maps annotated with split times, heights of significant points, important compass bearings etc. I also had most of the summit waypoints loaded onto my GPS so that I could confirm that I was in the correct place if needed. I only used this twice, to check that I had reached Chno Dearg in the dark and clag and to confirm the correct location for the river crossing on the night leg. There was still a bit of snow on the Ben and on a couple of north facing slopes but nothing that caused us to deviate from the planned route. We planned to start soon after midday going clockwise. The thought process behind this is that you’re starting having had a decent night’s sleep and have only been up for 4 hours or so (an evening or early morning start means that you’ve been up for hours already and are starting “tired”). 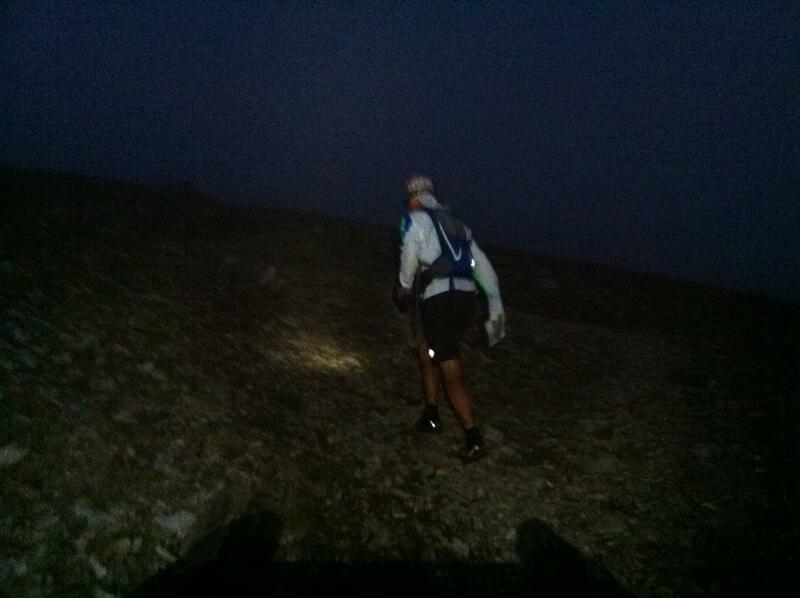 A midday start also meant that we would run the long flat section after Beinn na Lap in the dark. Navigation on this section would be easy and the terrain conducive to fast running, lessening the need to slow down in the dark. Also psychologically dawn is a good morale boost which is more welcome after several hours of running. We were hoping for a 23.30 round looking to start on schedule and pick up time on the last leg. 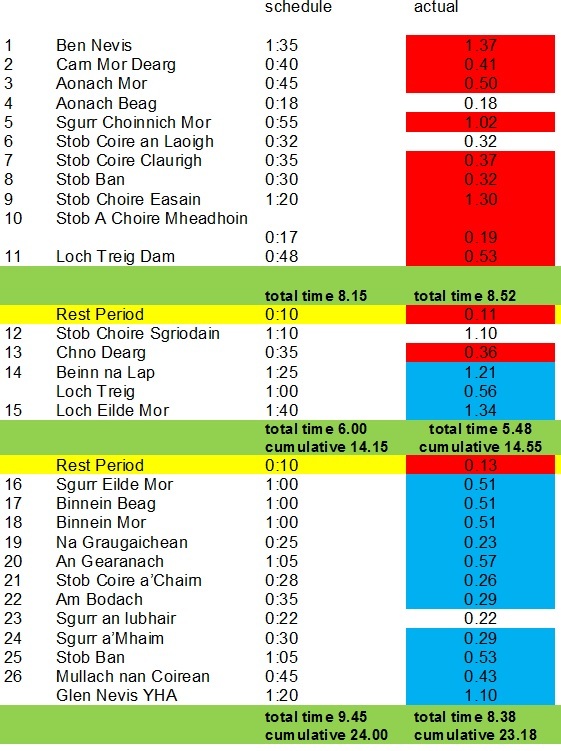 The chart below shows the schedule times and indicates where I was behind (red) and up (blue) on schedule. The schedule wasn’t realistic. In hindsight I’d add time to leg 1 and take some off leg 3. Know thy torch! 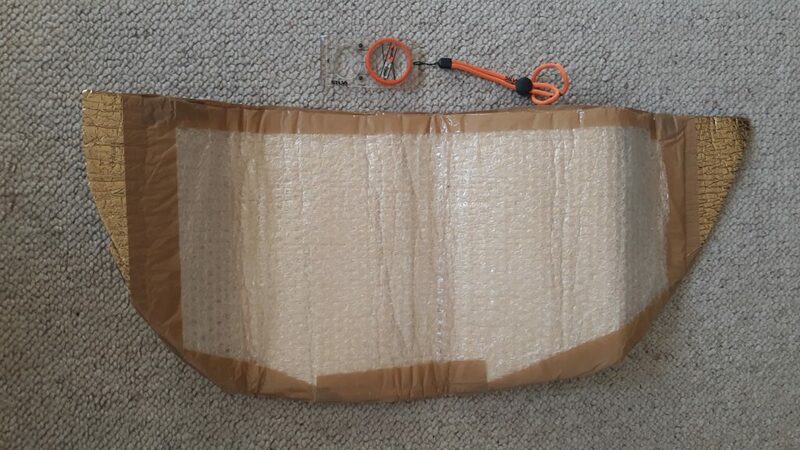 I chose the Petzl Nao for its long battery life – having it on full power defeats the object! I took too much kit. I could have done away with the long sleeved top and about a quarter of the food. It is very unlikely that two people running on the same schedule will be evenly matched; one may be finding it easy whilst the other is struggling so it’s good to have a plan for that situation. Leaving Ian, behind schedule and setting off alone into the night. Approaching Binnein Mor around 5am and getting back on schedule. The sun rose into a cloudless sky and a little bird was singing away. I felt then that I was going to do it. A big thank you to Helen Smith and Pawel Cymbalista for supporting us at Loch Treig where they waited in the rain, optimistically arriving early in case we were up on schedule! Also to Masa Sakano for cycling in to Loch Eilde Mor at night with a tent, stove and food for both of us (and for loan of his torch) and for waiting for Ian to arrive and lending him his bike to get back to Kinlochleven. 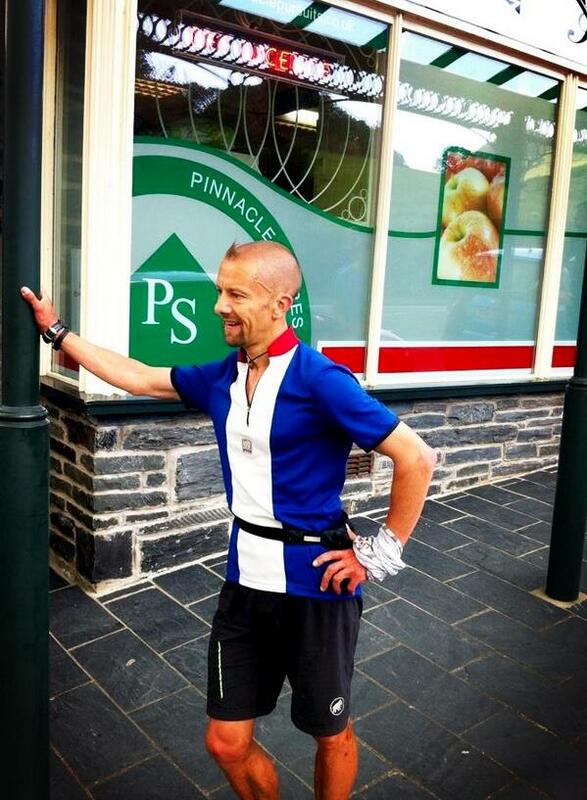 Also thanks to Ian Loombe for his company on leg 1 and for encouraging me to press on when he was struggling. What is the best thing for a runner to eat during a long run? Good question, and one to which there is no best answer. However there are certain things that work for me and I’m happy to share my thoughts. The basic science is that Carbohydrate is the body’s main fuel source for hard exercise. This is stored in the muscles and liver as glycogen, however the body has only got enough stores to last for about 90 minutes of hard exercise. So if your race or hard training run is going to take more than an hour and a half you are going to need to refill the tank as it were by eating carbohydrate rich food. 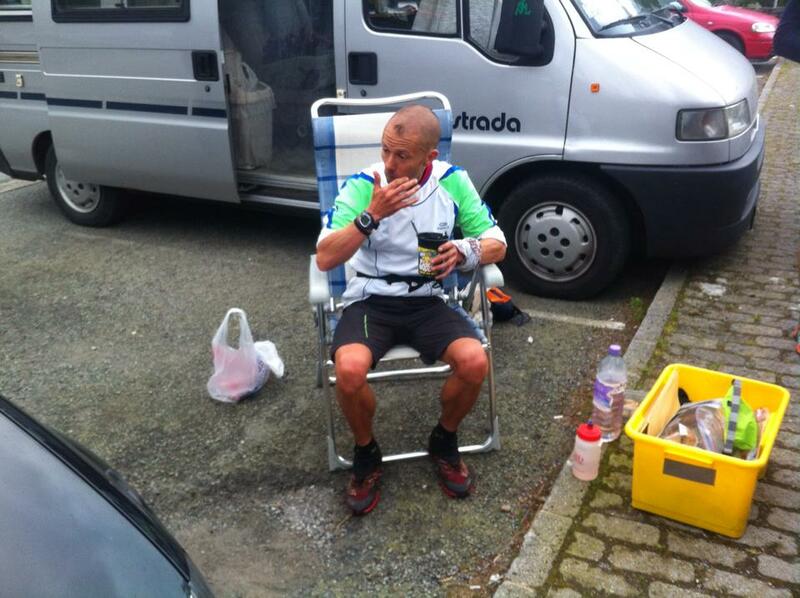 But with lots of choice of gels, energy bars and other food sources it can be hard to know what to use. 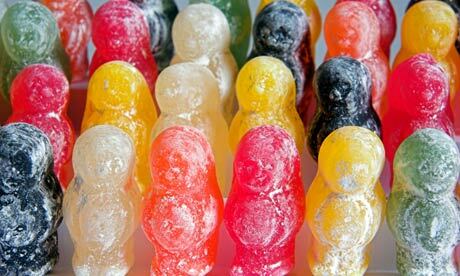 A lot of fell runners I know swear by jelly babies! They are easy to chew / swallow and have a high carbohydrate content. Whilst I have used them I find them too sweet and I prefer other types of jelly sweet. My current favourites are Tesco Cherry & Pomegranate Gummies. These are more chewy but much less sickly than Jelly Babies whilst still having a high carbohydrate content. I tend to look for sweets that contain fruit juice rather than just sugar such as the Gummies and Rowntrees Fruit Bottles. There are also a number of specialist gels and bars on the market. I use Science in Sport (SiS) isotonic gels. These have the advantage that they can be taken without water whereas most others are designed to be washed down with a drink and thus diluted. Some gels also contain caffeine although if I’m honest I haven’t noticed any difference between these and the non caffeinated ones. The bars also come with and without caffeine and resemble a very chewy flapjack. I tend not to use these as I find them difficult to swallow – they need a lot of chewing! – and it’s not ideal having a gob full of goo whilst trying to run fast! The new kids on the block are Cliff Shot Bloks. These are like the old fashioned squares of Rowntree’s jelly only slightly firmer. They are easily palatable and not difficult to chew. Although the packaging advises taking with water I have eaten them on their own with no ill effects. As these products have been designed with the athlete in mind they are seen as “specialist” and with that comes the inevitable cost. 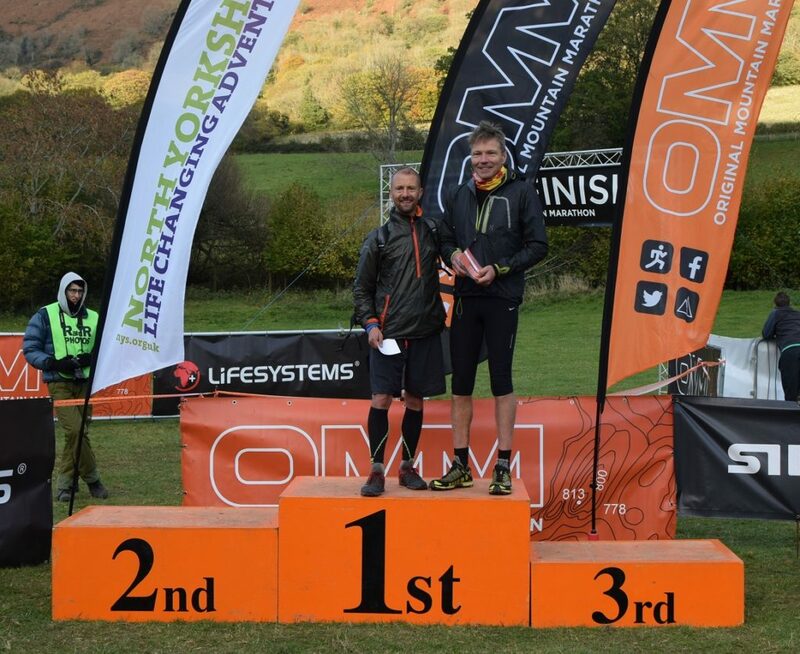 A single gel will cost £1, not a bank breaker on its own but if you are doing a high weekly training mileage, training for a long race for example such as the Ultra Tour of the Peak District, those pounds are going to add up. So are there any cheaper alternatives? I like to use Coconut bars, nice tasting with quite a high carbohydrate content and cheap (39 pence from Tesco). Other options are School Bars, these are fruit concentrate bars, and Peanut Brittle. Whichever method of refuelling you choose you can check the carbohydrate content by reading the nutrition advice on the label. Look for the value per 100 grams, that way you can compare like for like regardless of the weight of the packet. My strategy is to use sweets and alternative bars when training. Because I am not running as fast and can afford to stop for a few moments I am much less likely to inhale a peanut! I save the expensive gels and Shot Bloks for races. I might supplement the gels with a few sweets. Make sure whatever you choose is easily accessible, I carry them in a side zip on my bumbag. On a long run or race I will start snacking on the sweets after about an hour and take a gel after about 80 minutes of racing. I try to time the gel consumption to a steep uphill section where I am likely to be going slow and thus find it easy to open my bumbag and scoff the gel – it’s much harder to do this at pace. It takes about 10 minutes for the gel to take effect and the trick is to take the fuel on board before you feel the bonk. Whatever fuel you use on the hill, please don’t drop the wrapper – including the little tab off the top of the gel. Unfortunately empty gel packets are becoming a common site on some race routes. I rarely take a drink with me unless I’m on a long run in hot weather. Then I choose something like Tesco or Aldi’s own isotonic juice. This is much cheaper than Lucozade / Powerade etc and it seems to work. So what about post race? Well not only will you need to replace carbohydrate but protein as well. This is essential to allow your body to rebuild and recover. The general advice is to take on a carbo / protein mix straight after exercise. I do this with Frijj milkshakes – the chocolate and fudge brownie ones are Dee-lish! A cheaper alternative is Tesco Chocolate Milk, 2 for £2, better value but nowhere near as tasty! I will also have a banana with the drink. As with any food, one man’s meat is another man’s poison, or just because it works for me it might not for you. I know some people who react quite badly to certain gels whilst other people have no problem with them. The best thing to do is try a few different products and find what works best for you. And don’t use something on race day if you’ve never tried it beforehand – you don’t want to be diving into the bushes halfway through the race because your nutrition has given you the wrong type of runs!